→The Canon PowerShot SX530 HS: Is This the Camera for You? 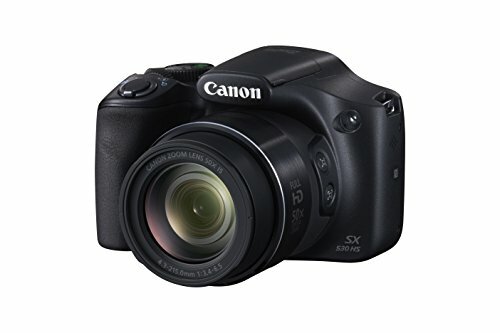 The Canon PowerShot SX530 HS is based on the 1/2.3 format, which uses a CMOS sensor that measures 1/2.3”. Although small, the sensor is larger than sensors found in traditional “point and shoot” cameras such as the Canon S120. The camera features 16.0 effective megapixels, which is more than enough resolution for the type of photography that the camera as designed for. What sets the SX530 HS apart from the other cameras in its class is the fact that it is a “super zoom” camera and features a 4.0X digital zoom, as well as a 50.0X optical zoom. The remarkable lens that provides this performance is a Canon f3.4 – 6.5, 4.3-215mm lens, which has a 35mm equivalent 24-1200mm! Hard to imagine how Canon was able to engineer a lens like this that covers a range from moderate wide angle to super zoom, all in a body that measures 4.72” x 3.22” x 3.62” and weighs only 15.6 ounces! Like most cameras in this class, the SX530 HS does not have a viewfinder, so images are composed using the fixed rear LCD screen, which measures 3.0” and is not a touch-screen display. The rear LCD screen is also used to navigate the camera’s extensive menu system, which is pretty intuitive and easy to follow. The LCD screen is also bright and easy to see even in moderately bright sunlight. It also provides 100% coverage of what is captured by the sensor, which means what you see on the LCD screen is exactly the image captured by the sensor. In addition, images can be composed using the “live view” function on the camera. The autofocus system on the camera features 9 autofocus points, which are evenly distributed on the screen. In practice, the desired autofocus point is easy to select. In addition, the photographer will find that the camera finds focus and holds focus easily. However, the camera does seem to struggle for focus on fast moving subjects, but the SC530 HSis not designed for sports and action photography, so it is important to manage your expectations accordingly! Once the image is captured, the camera’s DIGIC 4+ processor processes the image as a JPEG file and writes it to an SD, SDHC or SDXC memory card, which is held in the camera’s single memory card slot. The photographer can select to have the JPEG file image quality as either “Superfine” of “Fine”. Unfortunately, the Canon PowerShot SX530 HS cannot process files as RAW images, but perhaps Canon will incorporate this feature in follow up versions of the camera. The camera’s DIGIC4+ processor is pretty efficient in processing images, allowing the photographer to shoot at up to 10 frames per second depending upon the exposure mode used. Like most cameras, the SX530 HS has the standard exposure modes including Program AE, Shutter Priority AE, Aperture Priority AE, and Manual. In addition, the camera features a number of pre-set scene and creative exposure modes as well. These modes are very useful and easy to use as the camera does all of the work, allowing the photographer o concentrate on composition. More importantly, these settings are also fun to use! The various modes include toy camera effect, monochrome, super vivid, fish-eye effect and portrait. In addition to still images, the SX530 HS can also shoot full HD video with a resolution of 1,920 x 1,080. Various additional video formats are available including standard HD and miniature effect HD, as well as others. Depending on the format, the video is recorded at a frame rate of 1.5 – 30 frames per second. The video quality was overall pretty good and easy to shoot as well. Video files are written to the camera’s memory card as MP4 files. One of the drawbacks of the Canon PowerShot SX530 HS was the relatively slow shutter, which has a range of 1/2,000 to 1 second in most modes, although it can be increased in a couple of different modes up to 15 seconds. That being said, the shutter speed range is acceptable for most situations. It is somewhat unreasonable to expect DSLR performance out of “bridge” camera. Another weakness of the camera is in the native ISO range, which ranges from 100 – 3,200. While the upper range seems reasonable, many may find that the image quality suffers when images are captured using ISO 800 or higher. This is especially true when using the upper end of the zoom range in low light conditions. The inclusion of a built in flash makes this less of an issue in low light conditions where the subject is within 15 feet, where the flash can be effective. While the SX530 HS does not have a built in GPS system, it does have WIFI and wireless capabilities, which it allows the camera to communicate with a Smartphone or a tablet, as well as with the Canon Connect Station (CS100), where images and videos can be stored remotely in the “Cloud”. The ability to communicate with a Smartphone and a tablet allows the photographer to share images quickly on various social media platforms, as well as operate the camera remotely. Other features of the Canon PowerShot SX530 HS include an excellent image stabilization feature, which eliminates camera shake and is key to getting excellent results on a “super zoom” camera! The camera also includes a rechargeable lithium ion battery with a battery life of approximately 210 still images or 45 minutes of video per charge. The camera also includes a tripod mount, dedicated movie/video button, as well as polycarbonate plastic construction. The SX530 HS is currently made in China and is available at a suggested retail price of $379.99. Check out the latest prices and discounts here. Cost $379.99 Check out the latest pricing here. Bottom line is that the Canon SX530 HS is a really fun camera to shoot with, especially at the upper end of the zoom range! Many consumers will find it to be a great travel and vacation camera, as it allows a great deal of flexibility in composing images and video without the need to carry around a heavy DSLR kit with three or more heavy lenses. While the camera does have some drawbacks, the key to enjoying the camera is to manage your expectations accordingly and embrace the SX350 HS for what it is… a great “bridge” camera… more than a standard point and shoot, but less than a DSLR!